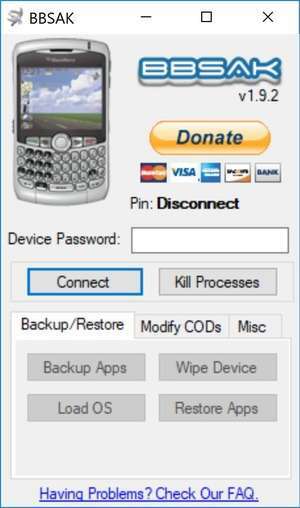 BBSAK (stands for BlackBerry Swiss Army Knife) is a very comprehensive tool built for BlackBerry owners. It might be considered the "BlackBerry PC Suite" of its class due to how much flexibility it offers. Perhaps the most useful feature of this program would be its automatic detection and backup/restore feature. This essentially allows you to backup your important data to your PC. Version 1.9.2 is a freeware program which does not have restrictions and it's free so it doesn't cost anything. For security reasons, you should also check out the BBSAK download at LO4D.com which includes virus and malware tests. Additional screenshots of this application download may be available, too.